Antarctic sea ice is hitting record levels. What does that say about global warming? The World Is Warming. So Why Is Antarctic Sea Ice Hitting Record Highs? Giant tabular icebergs are surrounded by ice floe drift in Vincennes Bay on January 11, 2008 in the Australian Antarctic Territory. For four days in a row this week, sea ice surrounding Antarctica has broken all-time records. But—get this—the ice is expanding, not shrinking. It’s the third consecutive year that the icebergs that surround the continent have expanded into unseen territory. What the heck is going on? Didn’t Antarctica get the climate change memo? Isn’t polar ice supposed to be melting? As long as humans have been keeping track, there’s never been this much sea ice surrounding Antarctica. What gives? First, let’s distinguish between sea ice and land ice. 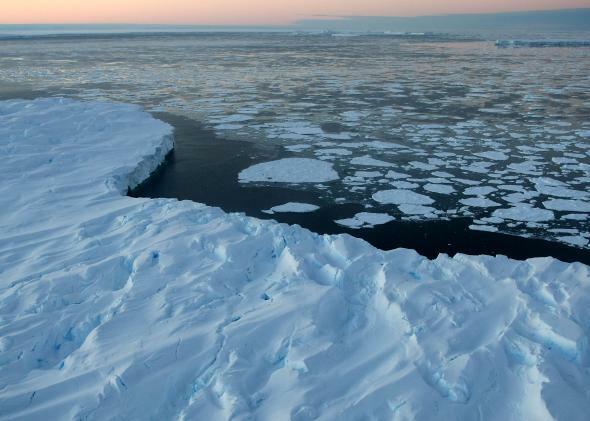 Since sea ice floats in the ocean, its growth or melt doesn’t affect global sea levels. Antarctic land ice, on the other hand, does contribute to sea level rise, and it’s losing volume at a record pace. In fact, a frightening study earlier this year found that a key glacier in West Antarctica has entered an inevitable, slow-motion collapse phase, with dire consequences for the world’s coastal cities. A follow-up study last month for the first time put an upper bounds on the impacts of melting Antarctic glaciers in our children’s lifetimes. The Antarctic (a cold continent surrounded by a warm ocean) is the geographic opposite of the Arctic (a warming ocean surrounded by cold continents). That difference, along with the fact that our economy is based on planet-warming fossil fuels, has allowed Arctic sea ice to dramatically decline in recent years, at a rate of about 4 percent per decade. At the other end of the world, Antarctic sea ice has been increasing at a fraction of that pace, less than 1 percent per decade. It seems weird, but like this winter’s epic polar vortex outbreaks in North America, this week’s record-breaking Antarctic sea ice could be a further sign of global warming. Even though there’s been more ice, the Southern Ocean is warming, not cooling. One theory says that warmer ocean waters are more effective at melting the tongues of Antarctic land ice glaciers that stick out into the sea. The resulting excess of freshwater raises the freezing point of the surrounding salt water, allowing more ice to form. Not only is the ocean around Antarctica warming, it’s warming at a rate faster than the rest of the world’s oceans. So why is there a record amount of ice? Another theory is that the winds that encircle Antarctica are growing stronger, in part due to the hole in the ozone layer, and pushing ice farther and farther away from the continent, allowing additional ice to take its place closer to Antarctica’s frozen shores. This theory is favored by the British Antarctic Survey, and a number of recent papers have backed it up. A third theory is that since warmer air can hold more water vapor, it’s likely that there’s more rain and snow falling over the Southern Ocean. That too could decrease the ocean’s salinity near the surface, boosting sea ice levels. The reality is probably some combination of the above. After all, there’s still a lot of legitimate debate among scientists on this topic. The Intergovernmental Panel on Climate Change, the leading global authority on climate change science, admitted as much in its latest report, which was released last year. New evidence shows the Antarctic sea ice trend itself may have been overestimated because of a statistical fluke. Eventually, scientists expect the sheer temperature increase from global warming to swamp whatever complex combination of atmospheric and oceanographic physics that’s producing the counterintuitive ice growth, and Antarctic sea ice will begin to decline as Arctic ice already has. 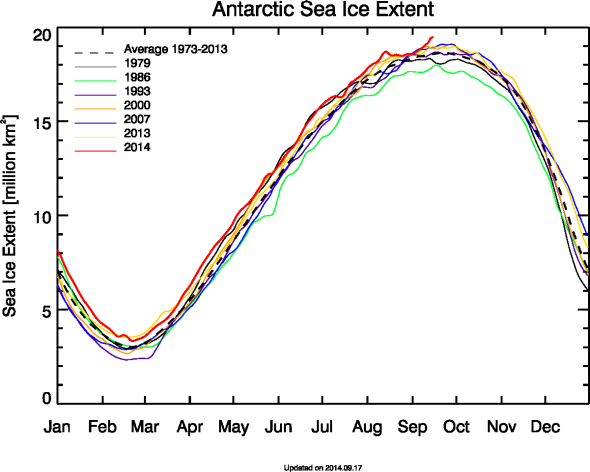 By the end of the week, Antarctic sea ice will probably set yet another record. Just remember, it’s definitely not because Antarctica (or any other large swath of the planet) is getting colder.